The 2017 French Open is upon us and from May 28th to June 11th Roland Garros will feature top tennis action. Who will win this year's edition? 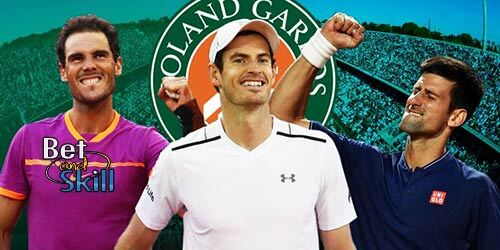 Find here our French Open men's tournament betting preview with tips, predictions, enhanced odds, no deposit free bets and bookie promotions! Rafa Nadal’s clay court form is beginning to reach the same level that seen him win nine French Open titles in the span of 10 years. Anyway, the Spaniard has been beaten by Dominic Thiem in his last match in Rome. Nadal is 17-1 on the clay in 2017 and has already claimed his 10th Monte Carlo Masters and Barcelona crown, also adding a 5th Madrid Masters title to his trophy cabinet also. Only two players have ever beaten Nadal in best-of-five-set matches on clay – Robin Soderling in 2009 and Novak Djokovic in 2015. On the first occasion Nadal was struggling with a knee problem; in 2015 his form had dipped considerably. Nadal's arch-rival and 2017 Australian Open winner Roger Federer will miss the tournament after suffering a knee injury that will keep him out of the sport for six months. Second-seeded Novak Djokovic is the defending French Open champ having beaten Andy Murray in four sets a year ago in the final, his first career title at Roland Garros. Anyway, after kicking off the 2017 campaign with a win over top-ranked Andy Murray in Qatar, Novak Djokovic has somehow lost his magic. The Serb has gone a mere 15-6 since that victory in January. Stan Wawrinka is just 2-3 on clay so far this season, including a 2-0 defeat at the hands of John Isner in the second round of the ATP Rome tournament. Prior to that, the Swiss suffered a round of 16 defeat to Pablo Cuevas in Monte Carlo. Anyway, he has reached the quarter-finals or better in seven of the last nine majors, crossing into the semi-finals on six occasions, and going all the way twice. Andy Murray's form on clay this year has been poor, winning five and losing four of his last eight games. Apart from a semi-final run in Barcelona; he has not won back-to-back matches on clay. He is currently on a two-match losing streak on clay, having lost to Borna Coric in the Round of 16 in Madrid, and fallen to Fabio Fognini in the opening round in Rome. Dominic Thiem, a semifinalist at this venue last season, has beaten Rafael Nadal 6-4/6-3 in the quarterfinals of the Rome Masters, gaining revenge after having lost in the finals of Barcelona and Madrid. He has recprded wins against Murray & Dimitrov, and two of his defeats came against Nadal. The big serving Austrian could have a favourable draw by facing either Stan Wawrinka or the out of form Novak Djokovic in the semi-final and avoiding Rafa until a possible final matchup. Question marks still surround the young prospect - he has only progressed past the last 16 once in a Grand Slam (French Open semi-final last year). Alexander Zverev is fast fulfilling his potential. He has won twice in May already including at the Rome Masters where he took care of Novak Djokovic in the final. There are plenty of dark horses for the title. Anyway, Juan Martin Del Potro, Kei Nishikori and Grigor Dimitrov all have injury concerns. Milos Raonic is not a clay court player, Marin Cilic will huff and puff, and David Goffin hardly can put seven matches together. "2017 French Open Men's Tournament betting preview, predictions, odds and free bets"